Serial is ending this week—but not without a crowdfunding campaign trying to glom itself onto the podcast's popularity first. "CrowdSolve - CrowdSourcing Adnan's Investigation" is thelogical convergence of online vigilante justice and dumb crowdfunding, and it represents exactly what is wrong with internet culture today. The ultrapopular podcast investigating the 1999 murder of a teenage girl has, of course, already spawned a fever pitch of speculation on Reddit (28,000 members at r/serialpodcast). Did her ex-boyfriend, Adnan Syed, really do it? 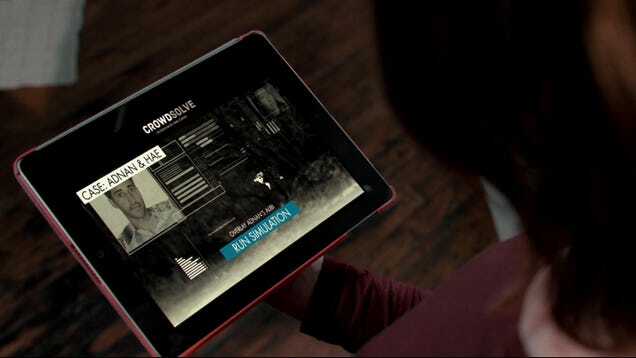 CrowdSolve wants $50,000 to build a platform for armchair detectives. investigations have gone horribly wrong before. Exhibit A, when a Reddit witchhunt wrongly identified a missing Brown student as the Boston marathon bombers. N(Oh hey, is now a good time to mention that CrowdSolve promises you a conversation with one of Adnan's former classmates for just $150? )ever mind that Reddit has spawned a hundred conspiracy theories but no new insights into Adnan's case. The incessant speculation about people's private lives have, if anything, been toxic to the individuals involved. CrowdSolve claims it will be better than Reddit, telling TechCrunch that it'll be built "ground-up to foster the exploration and exposition of criminal investigations in a transparent, tightly monitored way." So far, that seems to be mean building an iPad app. Because why not an iPad app, amirite? If this podcast about how seemingly arbitrary and unrelated factors can influence a jury to acquit or convict has taught me anything, it's that crowdsourcing the truth is a brilliant idea. Never mind, as well, that the guys behind CrowdSolve don't exactly have any experience with the criminal justice system. Sure, they have nice, slick infographics and cite the Innocence Project (by the way, here's how to give your money to the Innocence Project instead), but self-described "serial entrepreneur" Colin Heilbut's greatest hit to date is a "smart cat feeder." It's also worth pointing out that the Indiegogo campaign has flexible funding, meaning it gets any money it raises even if it doesn't meet its $50,000 goal—or deliver anything as promised. The biggest reward for backers of the CrowdSolve campaign really says it all. It has nothing to do with Serial or Adnan—and everything to do with making money.